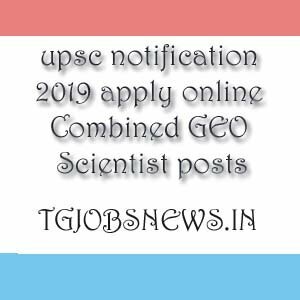 upsc notification 2019 has given the notification for the recruitment of Combined GEO Scientist posts. Candidates who are interested and willing for the upsc recruitment 2019 jobs can apply for the job after reading the particulars. And here, online application submission starts on 20/03/2019 and closes on 16/04/2019. Read the upsc recruitment jobs notification once or twice. If you are confirmed that you are eligible for the upsc recruitment notification then you can go to the direct website link Click Here. If you are unable to read the full notification then here it is a simple way. We have already given the details of the post. The details which we have given are very easy to understand. So go through it. The candidate should have the Master Degree in Geological Science or Geology or Applied Geology or Geo Exploration or Mineral Exploration or Engineering Geology or Marine Geology. Or Earth Science and Resource Management or Oceanography and Coastal Areas Studies. Petroleum Geo Sciences/ Petroleum Exploration or Geo Chemistry or Geological Technology or Geophysical Technology or Physics or Applied Physics or Geo Sciences or Integrated M.Sc with the relevant group. 32 years is the maximum age limit. And also the relaxations are applicable as per the rules. The candidates are selected on the basis of exam and Personnel Interview. Rs. 200 for the Gen and OBC candidates. And there is no fee for all the remaining candidates i.e, SC or ST or PWD candidates. After filling the application, take printout for future references. Note: Candidates must check the notification before applying for the job. You cannot afford to apply for the job if you are not eligible for it. For any Queries, ping me in the comments section. Aspirants have to visit TGJOBSNEWS.IN regularly to get latest updates for the government jobs…. Bookmark our site to get latest updates….